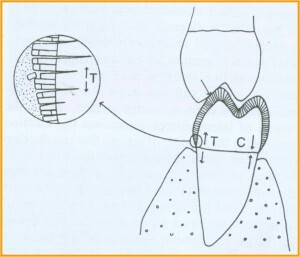 Defined as surface tooth structure loss resulting from direct frictional forces between contacting teeth. Myofunctional and TMJ problems should be resolved. The surface loss of tooth structure resulting from direct friction forces between the teeth and external objects or from frictional forces between contacting teeth components in the presence of abrasive medium. 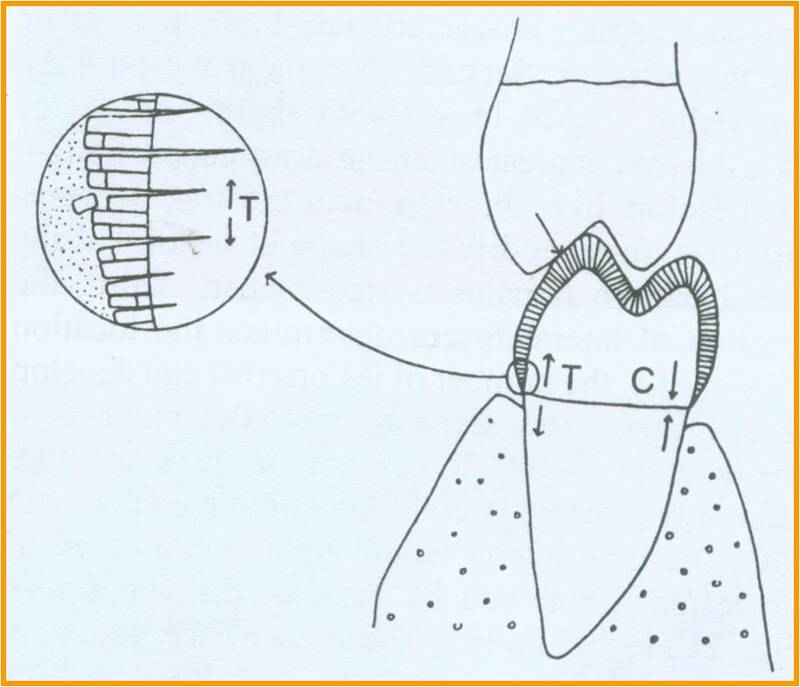 Loss of tooth structure resulting from chemico –mechanical acts in the absence of specific micro organisms. The ability of enamel to withstand stresses depends significantly on the direction of forces in respect to orientation of enamel rods. Forces are best withstood when they are in line with the rods, whereas under tensile forces that tend to pull the rods away from each other, enamel generally surrenders. causing certain interruptions and defects. In certain areas, these defects will be apparent in the crown portion of the tooth (teeth) and this is called localized, non hereditary enamel hypoplasia. The most prominent of these are exanthemata disease, nutritional deficiencies (especially vitamins A, C, and D) and hypocalcemia from any cause, or a microbial process as in syphilis. These include periapical infections of the preceding deciduous tooth (Turner’s hypoplasia), traumatic intrusion of the preceding deciduous tooth, etc. If the defect is in the occluding or contacting area, it is necessary to resort to metallic or cast restorations. Just as destruction of the ameloblasts can interfere with the enamel matrix formation, it can also interfere with the mineralization of this matrix, this will lead to non-hereditary enamel hypocalcification. Affected areas will not be defective in any way. However, they will appear chalky and soft to indentation, and will be very stainable. Therefore, teeth shades change very fast from chalky to yellow, to brown, dark brown, and or grayish. If extensive, these lesions predispose to attrition and abrasion. Also, the enamel can be chipped if the lesion involves the entire surface of a tooth. Vital bleaching, laminated veneering, composite veneering, and porcelain fused to metal and cast ceramic crowns are the treatments to be pursued. There will be no apparent destruction to be diagnosed or treated. These defects have same causes as hypoplasia. Even though the dentin will be present in substance it will be softer, more penetrable, and less resilient. Malformation should be differentiated from the illusion that can occur when there is a substantial discrepancy between tooth size and jaw size. The abnormality could be in the matrix formation leading to hypoplasia or it could be in the mineralization leading to hypomineralization. Full veneering includes procedures with metallic, metallic based, or cast ceramic restorations. 12: Dentinogenesis Imperfecta Or Hereditary opalescent dentin. The color may be from grey, brown, yellow-brown to violet. Most of them exhibit a translucent hue. The enamel, although intact, is easily chipped because of the defective dentino –enamel junction. There are signs and symptoms of extensive attrition. The dentin is devoid of tubules. The dentin contains a lot of inter globular dentin. The decay process, if initiated, will spread laterally. Dentin hardens and resilience is almost half that of normal dentin. This entry was posted in Uncategorized and tagged Abfraction lesions, abrasion, Amelogenesis imperfecta, attrition, Dentinogenesis imperfecta, Discolorations, erosion, Hypocalcification, Localized non-hereditary Dentin, Localized non-hereditary Dentin Hypoplasia, Localized non-hereditary Enamel Hypocalcification, Localized non-hereditary Enamel Hypoplasia, Malformations, non carious lesions, trauma on January 30, 2012 by meifong.